There have been at least four resident bobcats in Todd & Donette’s neighborhood. 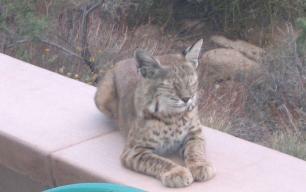 They do not feed the bobcats, but the individual animals regularly walk through the yard and come onto the patio. In the summers of 2005 and 2009 (at least) the pair (male shown bottom right; female in top right photo) had litters of at least four kittens. 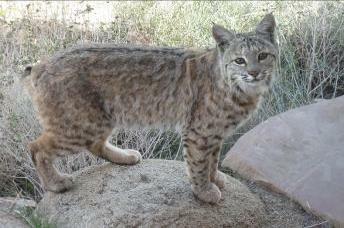 On January 2, 2011, a female bobcat was found dead in the rocks behind the house. There were no obvious signs of trauma or malnutrition. On January 22, 2011, Donette heard a weird braying like sound outside the house. There were three bobcats within eight feet of each other and they didn’t seem pleased. Two of them growled, hissed, swatted and brayed at each other until at least 5:30pm that evening. The supposition is that two males were fighting over a female and/or territory. The braying noise was a sound unlike anything we would have expected a member of the cat family to make—more like a sick cow’s moo! 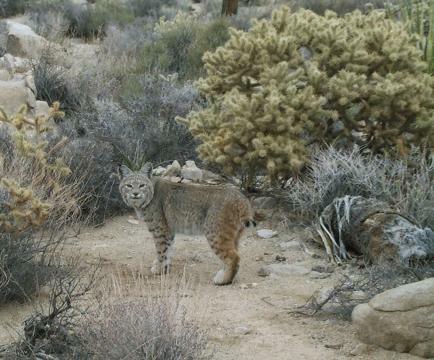 In the spring of 2012, four adult bobcats were seen walking together through the yard. 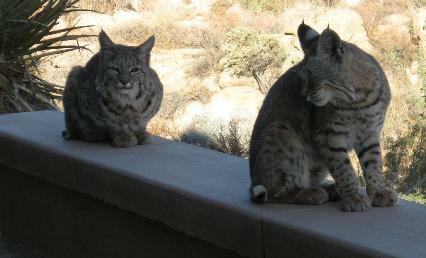 On October 30, 2012, three adult bobcats came onto the patio. Trapping occurred in the area in 2013, which ultimately led to a statewide ban on trapping in California. The trapping killed almost all of the bobcats in the local area. Since then, the population has slowly increased. As of January 2019, there are two bobcats that are regularly seen in the neighborhood.